Navigator Systems have long been involved with helping the busy rental warehouse meet their PAT obligations. Back in 1995, our first software release, TestTrack, revolutionised the industry by talking directly to the testers of the day (Seaward 2000i and Barron Macann) which allowed the user to fully automate the testing process. This saved an enormous amount of time allowing the users to work much more efficiently, which led to a huge shortening of the time take to test equipment. The TestTrack program then evolved into the testing module, firstly in HireTrack V1, then HireTrack Eclipse and now in HireTrack NX. Over the years the module has been expanded to include rigging (LOLER) testing and is unique in that it will simplify and accelerate your PAT and Rigging equipment testing and be a major asset to your business. Electrical safety testing (PAT) is completely automated within HireTrack NX, when using the Barron McCann BPT3000 PAT tester, or semi-automated when using the Seaward PATS+ range of testers. 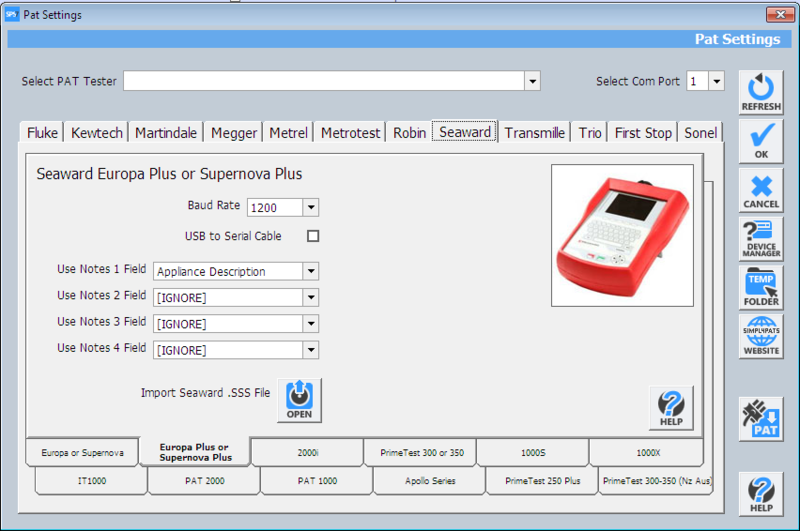 HireTrack NX can also import test data directly from SimplyPats, the leading stand-alone PAT testing software, transferring your test data directly avoiding errors, saving time and improving efficiency. 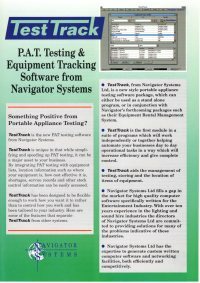 SimplyPats can communicate and upload test results from over 50 models of PAT tester, from manufacturers such as Seaward, Fluke and Metrel. Automated testing – removes the risk of damaging equipment by applying the wrong test. Variable pass limits give you the flexibility required to test cables and other equipment without bending the rules’. Results may also be entered manually and the software will automatically verify whether the values should result in a pass or a fail. The system fully supports equipment that has several electrical ‘ways’, such as multicore cables – allowing them to be tested as one item. Rigging tests may be carried out either internally or by an accredited outside body. The results may be stored in either case. All types of equipment may be allocated electrical tests, rigging tests or both. Tests can have up to three visual inspections defined, which must be passed before the test can continue. The testing module supports two levels of security so that operators can test equipment and view results, whilst only supervisors can set-up and edit crucial information. Equipment testing schedules can be defined independently for both electrical and physical (rigging) tests. Testing intervals may be defined in terms of time e.g. PAT Test every 30 days, or jobs e.g. Test after every job. 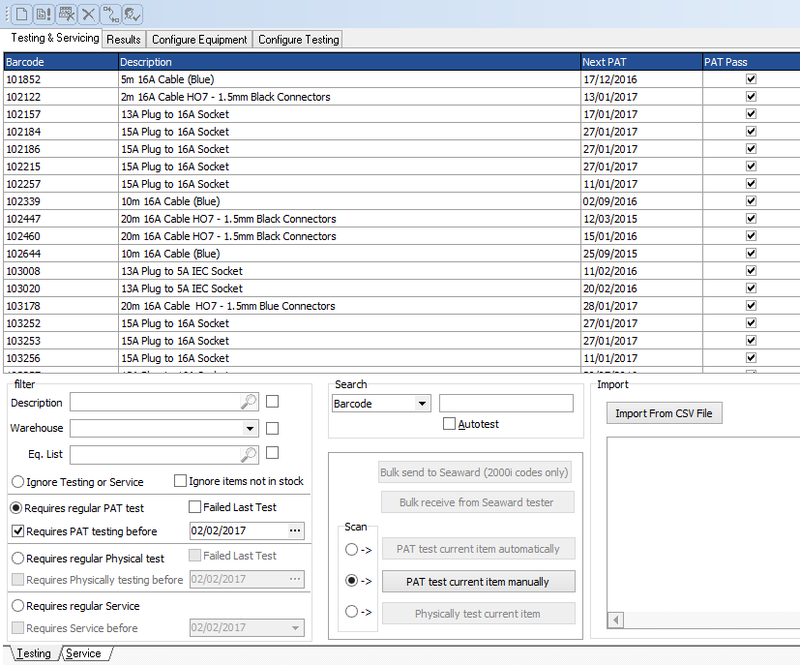 The testing module fully integrates into HireTrack, for example, items which fail any tests are prohibited from being scanned out for hire if they are accidentally selected from stock. Additionally the testing module keeps track of all servicing and maintenance records. The results for each test is stored against the item tested and a test certificate can be printed for any item or group of items. 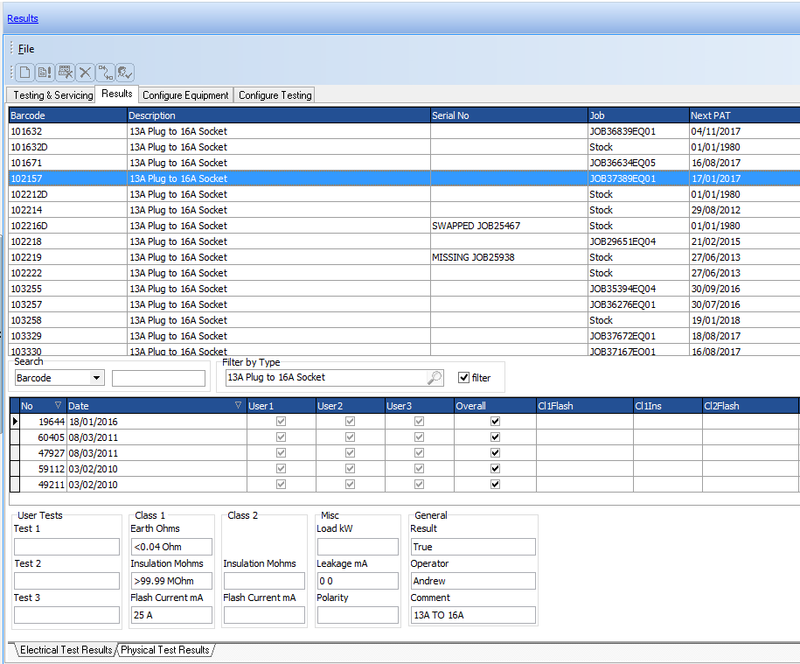 The Testing Module seamlessly links to all the areas in HireTrack NXwhich work with “itemised” or barcoded equipment.